Turn your tassel and toss your cap in the air, its graduation time and your throwing a party. Whether you aim for elegant and sophisticated or cute and ironic, you can't go wrong with a party source's collection of graduation party ware. 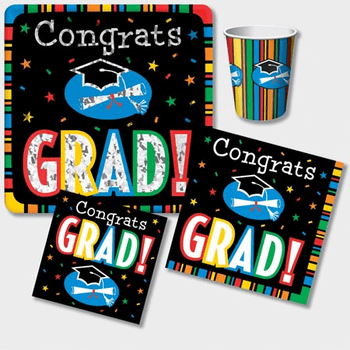 From parrots surfing, to black and white commencement finery; whatever your vision, we have the graduation party tableware to help you throw a party with class for the class of '14. It's all in the details. Throw a party with honors and check out our coordinating tablecloths and napkins in your school colors. Although their thirst for knowledge has been quenched, your guests still need to drink. We have a complete line of punch bowls and cups of all sizes. Explore our drinkware and serveware sections and see for yourself the wide range of choices. Graduations are all about new beginnings. Make sure your party is anything but old with our innovative and original designs. Your party is sure to be a smash.